The latest comprehensive solar tracking data from GTM Research is good news across the board for the global solar industry, which is currently tracking 17.4 GW of solar PV tenders, predicts 9.6 GW will be awarded in the third quarter alone, and expects global demand to exceed 80 GW for the first time — in a year which actually sees smaller growth. 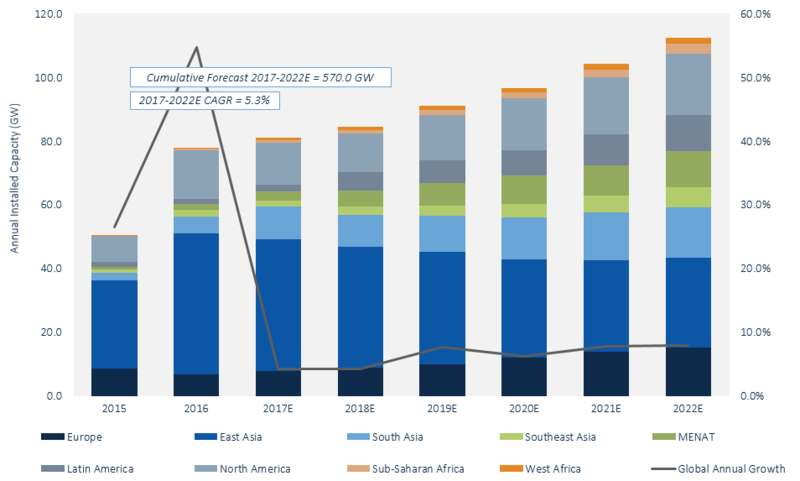 GTM Research published its latest Global Solar Demand Monitor on Tuesday, detailing global market trends for the second quarter and predicting trends for the future. The report is difficult to narrow down to one particular headline, considering just how many different exciting trends we are seeing across the industry. GTM itself is highlighting the fact that Europe now leads as the region with the greatest share of tendered solar PV, with 8.1 gigawatts (GW). However, the report also highlights that GTM Research is now tracking 17.4 GW of confirmed solar PV tenders in auctions across the globe and that 9.6 GW will likely be awarded in the third quarter alone. To top off the impressive headline-stats, 2017 global demand for solar PV will exceed 80 GW for the first time, despite the fact that year-on-year growth will actually fall from 2016’s impressive 55% to a more sustainable 4%. Looking specifically to confirmed solar PV tenders, GTM Research is currently tracking 17.4 GW worth expected between the second quarter of 2017 and the end of 2019. Europe leads the way, as mentioned, with 8.1 GW, followed by South Asia (India) with 3 GW, and MENAT (Middle East North Africa Turkey) with 2.6 GW. It is important to note that 5.3 GW of the confirmed tenders GTM is tracking are for technology-neutral auctions in which solar will compete against other renewable energy sources. Further, GTM Research predicts that the solar PV tender pipeline will only continue to grow as we move forward, with countries such as Algeria, Japan, and Italy all currently in the process of setting up tenders for utility-scale capacity auctions, while India’s solar PV tenders are usually only confirmed a little before bids are submitted, meaning that there is less long-term stability, replaced with spur of the moment-type momentum gains. Global demand again will see China lead the way with in excess of 30 GW, demonstrating, as the authors of GTM’s report put it, “the industry’s dependence on China’s opaque policy-driven demand.” The United States, despite 97% growth in 2016, will see its demand contract by over 16% before its utility-scale pipeline is replenished, while in India, a 30 GW tender pipeline hand-in-hand with declining costs will spur a 90% increase in solar PV demand this year. Looking forward, as can be seen in the graph above, GTM predicts global solar PV demand to reach 112.5 GW in 2022, with a cumulative forecast between 2017 and 2022 of 570 GW at a compound annual growth rate of 6.7%, bringing the global solar PV install base up to 871 GW. Specifically, GTM predicts 2017 will install 81.1 GW of solar, up from 2016’s 77.8 GW. Slowing demand in East Asia will be compensated by strong growth in emerging markets. China will obviously remain the largest global market by a significant margin, but its market share will diminish somewhat as tender-driven markets continue to drive growth outside of traditional regions. Specifically, The Middle East, North Africa, Latin America, and Southeast Asia regions are all expected to make moves over the coming years. 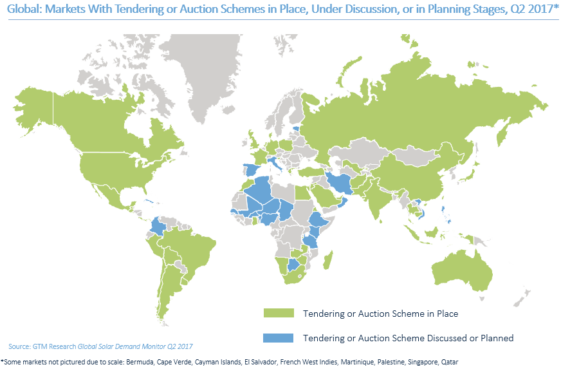 Particularly, GTM highlighted the upcoming competitive reverse auctions in Saudi Arabia, Malaysia, and Zambia, as results worth paying attention to for a guide of the longer-term potential for solar in these new emerging markets. Meanwhile, looking back to the major regions, France, the Netherlands, and Ireland are expected to be the major drivers of growth in Europe as we move forward, well exceeding the additions made by established European markets like Germany, the UK, and Italy.